Terry Vaughn was born December 25, 1971 in Sumter, South Carolina. Prior to joining the CFL, Vaughn played four seasons with the University of Arizona Wildcats and by the end of his collegiate career he was one the schools top 10 all-time receivers. 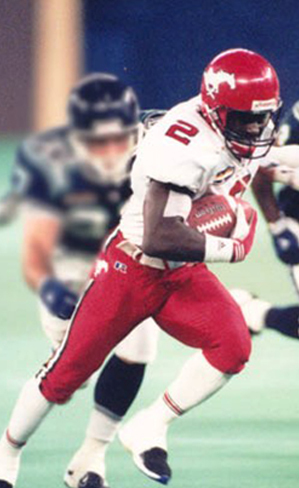 Vaughn signed with the Calgary Stampeders in 1995. On August 6, Vaughn had his first game with +100 yards and was named offensive player of the game after recording six receptions for 123 yards and two touchdowns. In 1996 and 1997 Vaughn was named a back-to-back Western All-Star. In 1997, he was named offensive player of the game on three different occasions. He finished the season with 81 receptions for 1,057 yards and was tied for the team lead with nine touchdowns. In 1998, Vaughn earned his first CFL All-Star and his third consecutive Western All-Star honours. He finished the season second in receiving with 81 receptions for 1,045 yards and 5 touchdowns. He also won his first Grey Cup when the Stampeders defeated the Tiger-Cats. In 1999, Vaughn signed as a free agent with the Edmonton Eskimos. He led the team in receptions with 75 for 1,057 yards and a career high of 11 touchdowns that season. On August 13 he would set an Eskimos’ single game record with 10 receptions for 275 yards and two touchdowns. For the fourth year in a row he would be voted a Western All-Star as well as having his fifth season with over 1,000 yards receiving. Vaughn would have one of his best seasons in 2001. He led the league with 98 receptions and 1,497 receiving yards, had his seventh season with over 1,000 yards receiving, caught 10 passes in a single game three times, and had over +100 receiving yards in five games. He was a CFL All-Star for the second time in his career and Western All-Star for the sixth consecutive season. Vaughn’s outstanding career continued in 2003 when he had his ninth season with over 1,000 receiving yards. He had a career high of 106 receptions for 1, 558 yards and won his second Grey Cup Championship. At the time of his retirement, Vaughan held the record for most consecutive seasons with 1,000 yards receiving (11) and second for Most All-Time Receptions with 1,006 catches. Terry Vaughn was the first receiver to in the CFL to reach over 1,000 career catches and was ranked number 45 on TSN’s Top 50 CFL Players.